As summer draws to a close and we slip into autumn my tastebuds and thoughts turn to savory and cozy food and experiences. Yet, with the heat lingering I am not quite ready to say farewell to the summertime. One of my favorite summer memories is from my childhood on the West Coast. Every summer my family would go camping and, of course, make s’mores. Yet in my years on the East Coast I have spent many a fall evening around our fire pit indulging in that same sweet treat. As I say goodbye to summer and welcome fall, I made a more elegant version of this campfire favorite. This s’mores recipe has a subtle balance of sweet chocolate, smooth creamy toasted marshmallows, crisp and spicy gram crackers (gluten free) with a slight salty hit. Hostess Tip: Check with your supervisor before you bring in treats if necessary. While this is an ideal treat on a hot September day, it would be equally delicious and refreshing any time of year. The toasted marshmallow ice cream and the gluten free graham crackers also are quite versatile on their own. With a few modifications of recipes from Dolly and Oatmeal they have definitely become staples in our house. Making the s’more sandwiches is a bit labor intensive but well worth the effort. I split the process into two days; making the ice cream and graham cracker cookies one day and assembling the sandwiches the next. The rave reviews and smiles I received, as well as enjoying the extras with my hubby that evening, melted away any thought of my labor. 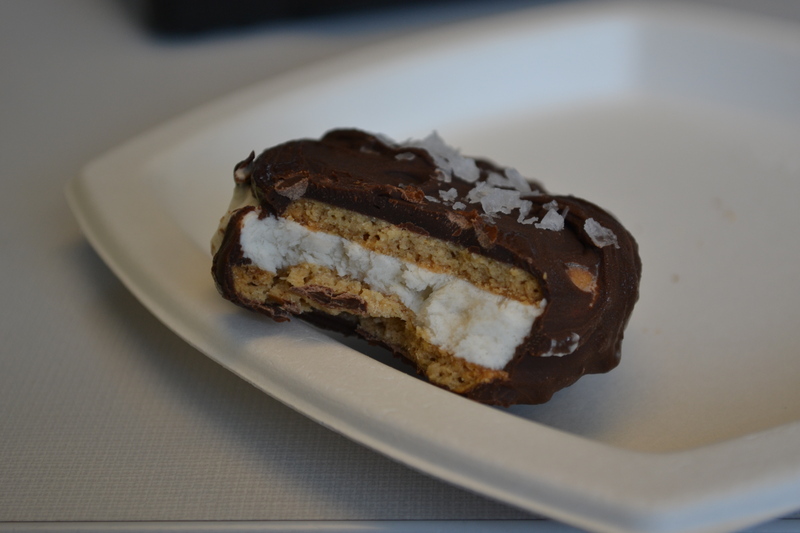 Hostess Tip: To transport the ice cream sandwiches to work make sure to pack an ice pack. The fun part about bringing these treats to work is the absence of any prep or presentation requirements once you get to the office. I simply transported the treats to the office in a tupperware container and stored in the freezer until mid afternoon. My office provides plates and napkins in our kitchen so I grabbed a few of those and headed to the conference room. I then sent an email to my colleagues to let them know the treats were ready. For the most part my co-workers indulged in a much needed break that refreshed their minds, tummies, and spirits. Some even dove in for seconds. However, a few colleagues could only enjoy the conversation for a few minutes before work called them back to their desk. Everyone appreciated the brief respite and had a brighter afternoon. As with all culinary endeavors, good planning sets you up for success. I chose a day when our office tends to be less busy. I set aside enough time for preparation so I didn’t feel rushed. The result was a successful attempt to bring hospitality to those with whom I spend my working hours. Hostess Tip: To manage my time I made the ice cream and cookies one evening and assembled the sandwiches the following day. Prepare the ice bath. Take a large bowl and fill halfway with ice and water. Place a medium size mixing bowl inside. Set aside. 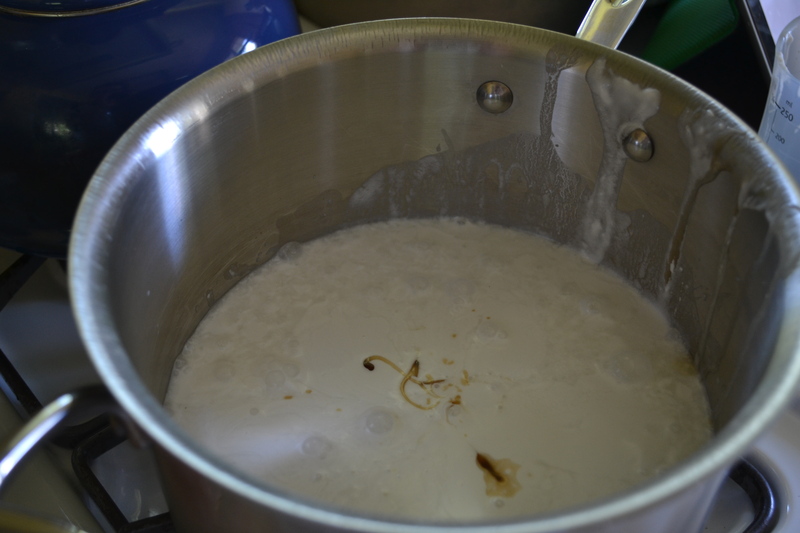 Whisk together milk, maple syrup, and vanilla in a saucepan over medium heat until combined. Remove a few tablespoons from the pan and mix with the cornstarch in a separate bowl. Once fully dissolved add cornstarch mixture to saucepan and combine completely. Continue to stir and heat mixture until fully warmed, steam will be rising. Do not boil. Remove pan from heat and pour mixture into medium bowl in ice bath until cooled. Once the mixture has cooled to room temperature pour into ice cream maker (follow manufacturers directions). 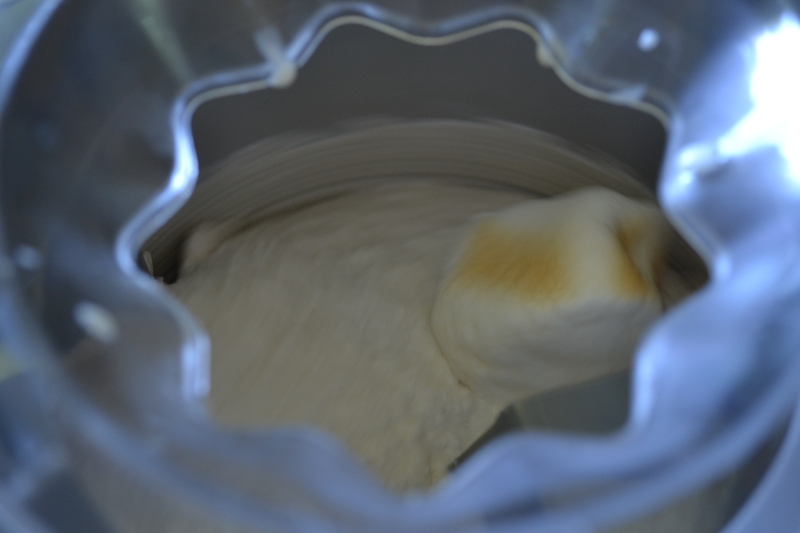 Churn for about 10 minutes or until ice cream is just starting to freeze. During this time grease baking sheet with coconut oil. 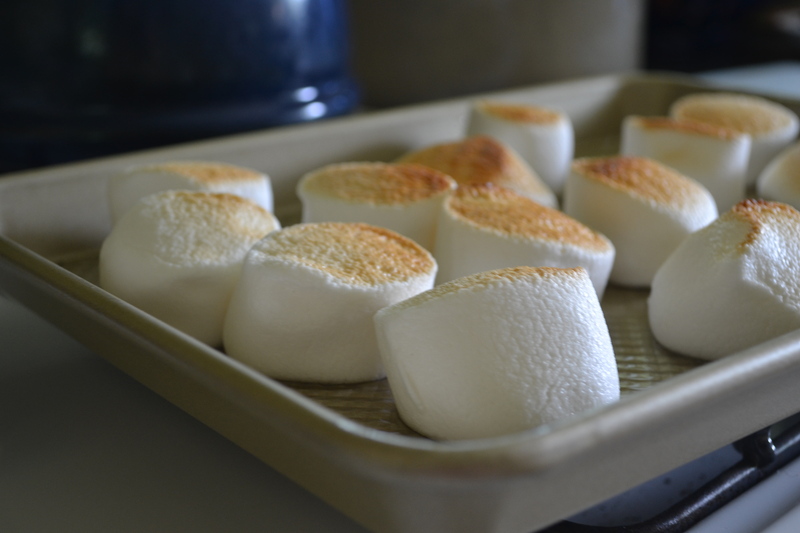 Arrange marshmallows on the baking sheet about 2 inches apart. Place the marshmallows under the broiler for a few seconds on each side, enough to toast them. Remove the tray from the oven. As the ice cream is just starting to freeze, take one marshmallow at a time and gently stretch it. Add the stretched marshmallow to the ice cream. Let it mix a little, about 10-20 seconds between marshmallows to allow incorporation. 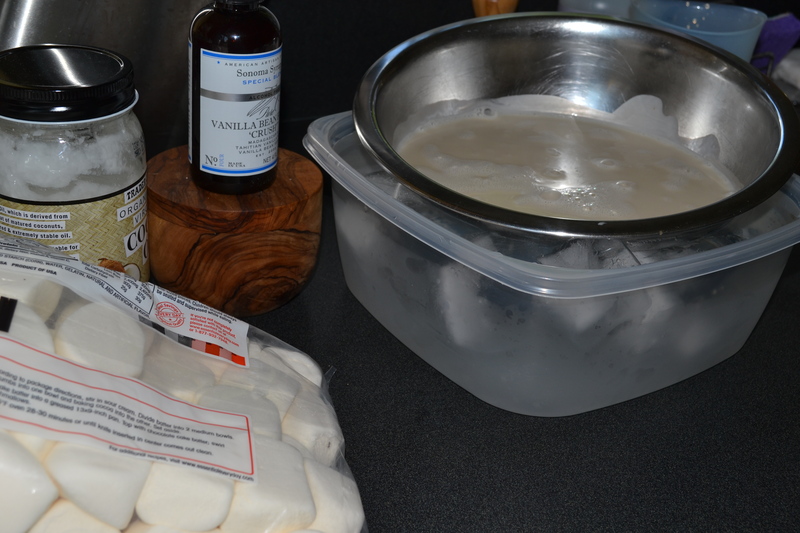 You can not let the marshmallows cool before adding them or they will not ribbon through the ice cream. Hostess Tip: Toast your marshmallows in two batches to allow for better ribboning. While the ice cream is finishing line a half baking sheet with parchment paper, make sure it comes up above the edges. Once ice cream is ready, smooth it in an even layer into baking sheet. Cover with another piece of parchment paper and smooth. Place in the freezer until ready to assemble, at least 2 hours. 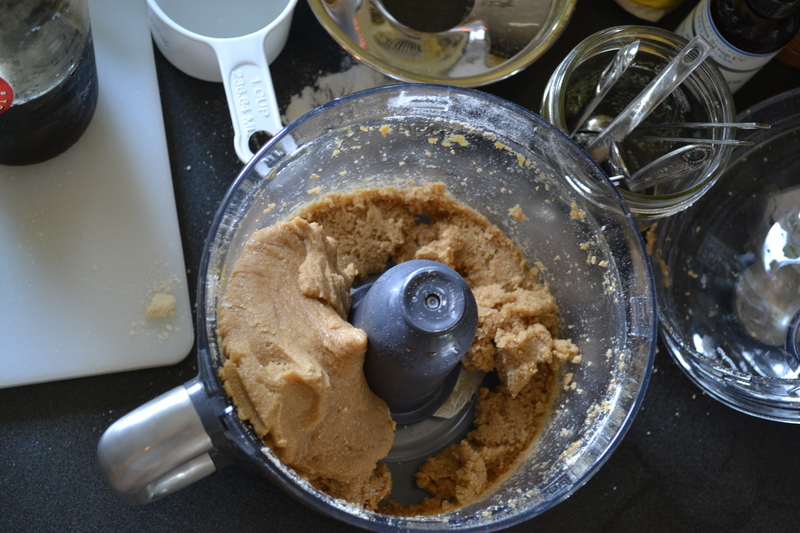 Add all dry ingredients to your food processor and pulse until mixed. Add milk, maple syrup, and vanilla and mix until a dough begins to form. When the dough is moist and sticky to the touch it is ready. If needed add more milk until proper consistency, ½ teaspoon at a time. 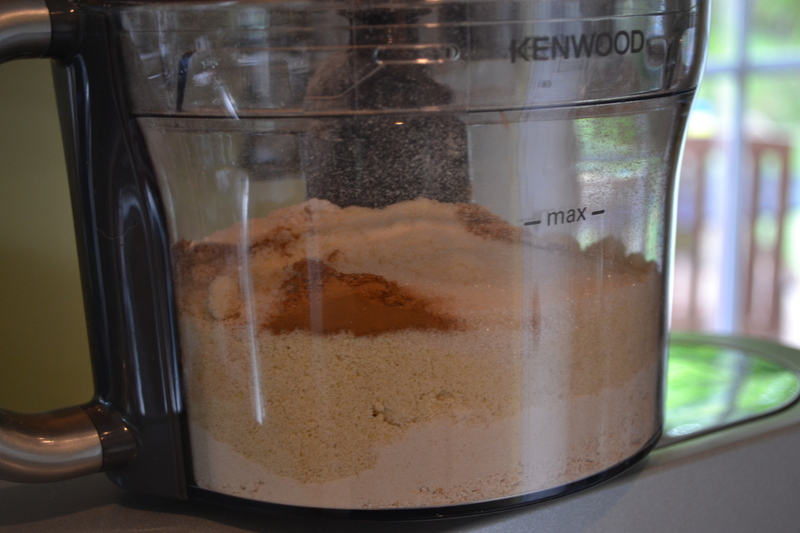 Remove the finished dough and place on rice floured surface. Knead a few times and form into two dough balls. Wrap in plastic and place in the refrigerator for at least a half our. While dough is chilling, preheat the oven to 350°. Once the dough is chilled, remove from refrigerator and let is sit for 5-10 minutes on the counter. You want it chilled but not too cold to work with. Coat the dough in flour and roll out to about ¼ inch thickness. 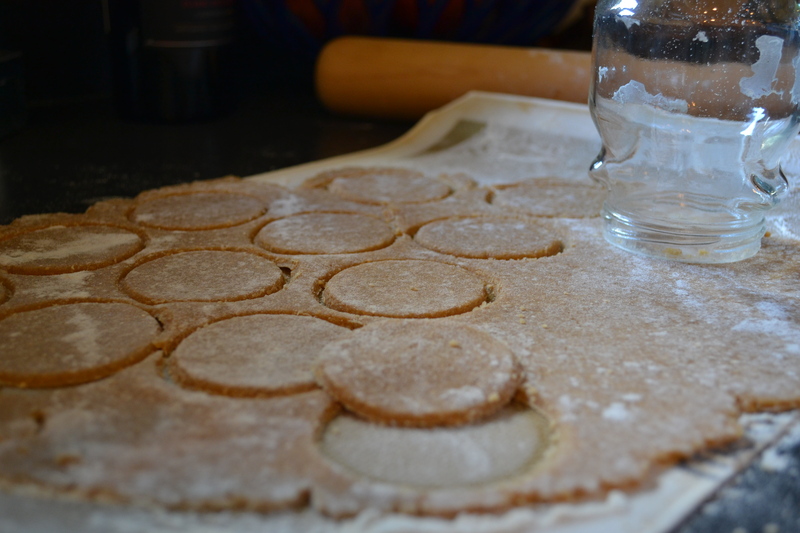 Using your cookie cutting tool cut rounds and place on well greased, or silpat covered, baking sheet. You can even add the holes on top with a fork. Bake for 10-15 minutes or until lightly browned on the edges. 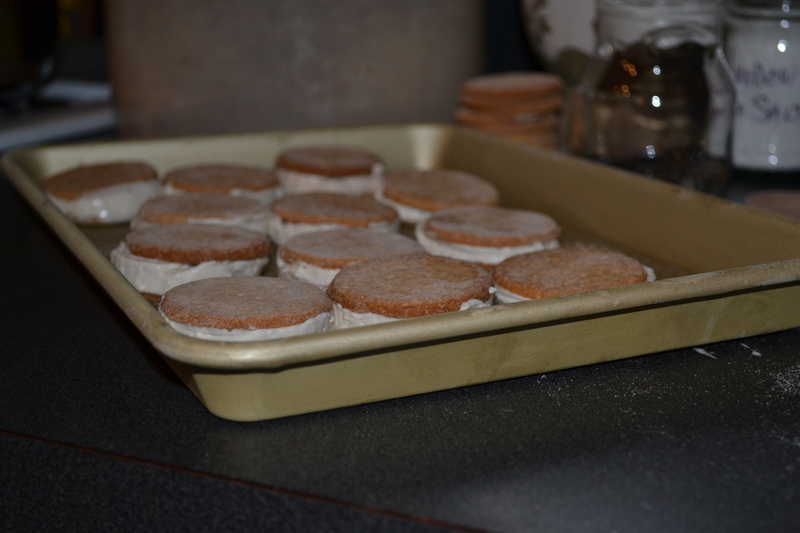 Place cookies on rack until completely cooled. Store in an airtight container. Place a piece of parchment paper under a cooking or cooling rack. Have Maldon salt and have 2 forks ready. 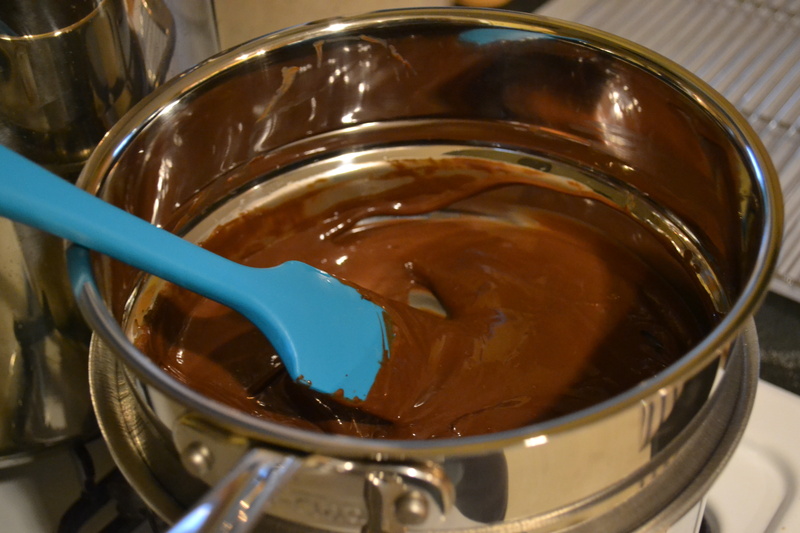 In a double boiler melt half the chocolate completely. 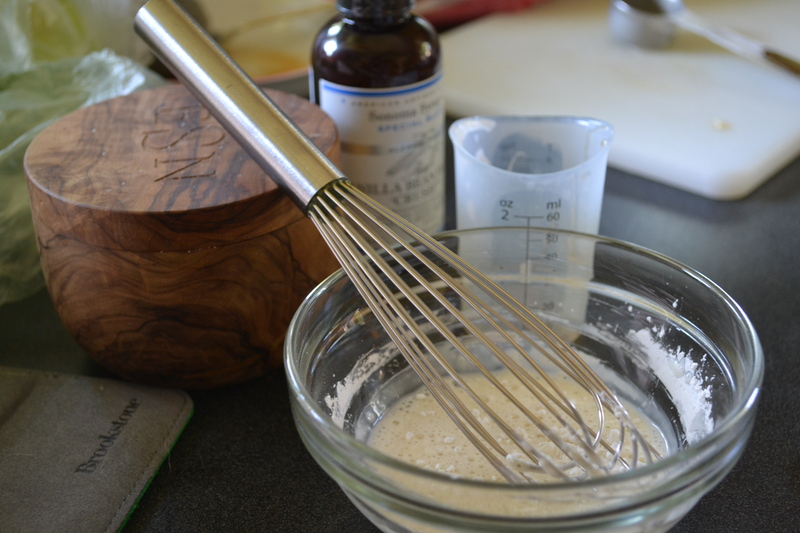 Once melted, add ½ a tablespoon coconut oil until just mixed through. Reserve remaining chocolate and coconut oil until needed and repeat process. When you are ready to assemble lay out half the cookies (10) on a half sheet baking sheet, top down. Take the ice cream tray out of the freezer and remove the parchment covering. Let it sit for about 2-3 minutes. Just enough to soften slightly but do not let it get soupy. 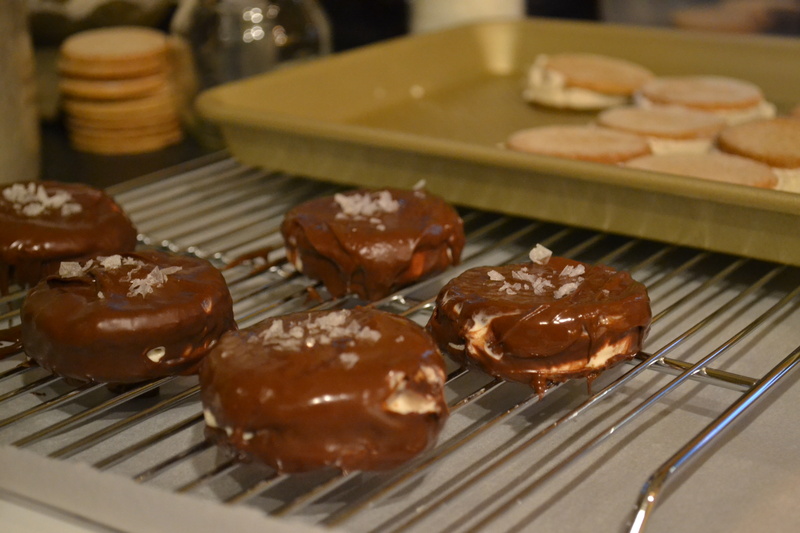 Using your cookie cutting tool, cut the ice cream and place rounds on the cookies facing down. Take a second cookie and place on top, completing the sandwich. Smooth outer edges with the back of a knife, if needed. Return completed sandwiches to the baking sheet. Once the baking sheet is filled return to freezer for about 20 minutes. If the ice cream is melting too much return immediately to freezer to re-set. 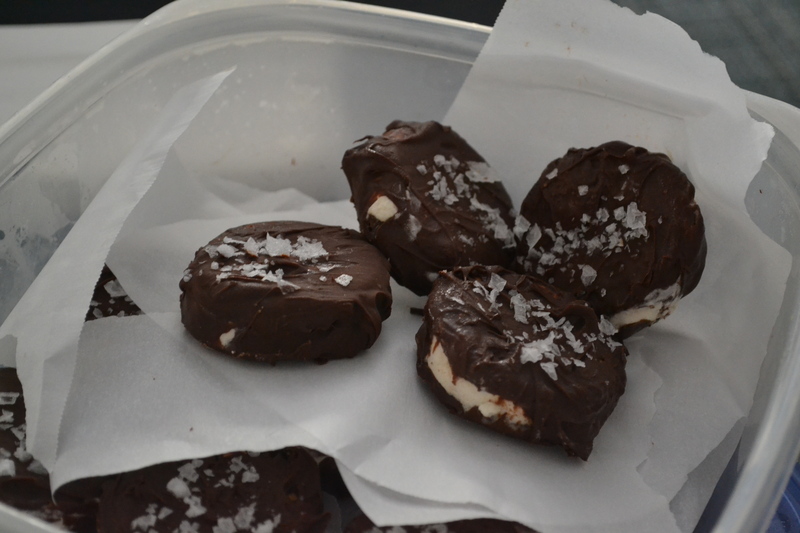 Once chocolate is melted and coconut oil combined, remove tray of sandwiches from freezer. Using two forks lower the sandwich into the chocolate and rotate to cover completely in chocolate. As you remove the covered sandwich from the chocolate, using the forks, allow excess chocolate to drip away. Replace the sandwich on the baking sheet. Sprinkle with a pinch of Maldon salt. Once the sandwiches are all coated and salted, return to the freezer for 10 minutes. Again, if the ice cream begins to melt to quickly, return the tray to the freezer until set again. After all sandwiches have been completed and re-set in freezer, remove them from baking sheet and place in airtight, freezable, container until ready to serve or transport. I’m still having dreams about these! They were simply fantastic!